Bishop has accumulated a lot of knowledge through his 30-year precast career. He takes that expertise on the road with him as he visits precast plants nationwide, leading educational form release agent demonstrations. Understanding how form release agents affect concrete is important, Bishop said. If the mix is good and proper vibration practices are being followed, the wrong release agent — or even the improper application of the right release agent — can lead to staining, discoloration or excessive bugholes on finished concrete, as well as build up on form surfaces. Bishop’s demonstrations provide solutions to these common problems. 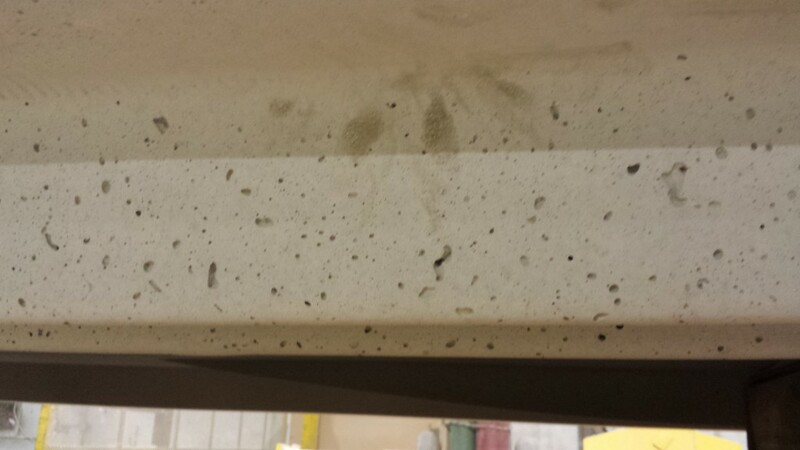 Example of bugholes in finished concrete. Before he leaves the office for a trip, Bishop prepares as best he can. He learns the location’s mix design, form types used, whether pouring is done inside or outside, how the product is cured and other essential information. When Bishop arrives at a plant, he meets with the team, takes a tour, and inspects finished pours to see what quality issues need to be remedied – without impeding productivity. During demonstrations, Bishop ensures he’s educating employees, not simply giving them a lecture. Bishop measures before and after employees apply both the Nox-Crete form release agent and current product, then compares the results. At a recent demonstration, Bishop found that one Nox-Crete release agent covered more than 3 times the form area than the location’s current form oil. Though he does encourage the use of Nox-Crete products, Bishop’s goal isn’t sales, it’s education. He wants to ensure plant operators and employers maintain their reputation and grow their business.